I love Marshalls! It’s seriously my most favorite place to shop on the planet. My love for Marshalls started when they opened their new location not too far away from where I lived. And I’ve been going there practically every once or twice a month. They’ve the most selections of fashion clothing, designer handbags, shoes, furniture, home decors and a nice section for beauty stuffs. I love the excitement of finding hidden treasure while I shop. So, during our last trip, I was lucky to find some goodies for a fraction of the price. Yippee!!! I’ve always wanted to try out the Cover FX Contour Kit since it was first launched and now I’m just so happy to add this to my makeup collection. This is my favorite discovery from my last trip to Marshalls. It was one of the many gems I purchased and the best part is it comes with an amazing price tag. A convenient contouring palette to contour, strobe and highlight your complexion. I like that it’s vegan and free of fragrance gluten, mineral oil, and talc. Perfect for sensitive skin and all skin-types. I’ve been wearing them non-stop since I got it and the love I gave for this kit is visible here. Let me know if you would like to see me do a review on this product in the comment section below. While the most expensive products listed, this palette was marked down to $24.99 while it was retailed at Sephora for $59.00, so you do the math! This is by far the best steal item I found and I think it’s worth checking at your local stores. I’ve heard so many positive things about this palette and having tried it myself these past few days, I’ve been falling head over heels with this palette. If you love chocolates, then the scents alone will keep you hooked. I’ll keep you posted on this one in a separate post once I got back from travelling but for now, as I mentioned earlier, the price alone is a motivating factor for you to check it out. Can this brush be any cuter? If you’ve been following my blog, you might know that I’m a sucker for cute stuff. So, when I saw it, I just knew that it was made for me. The synthetic hair is the softest I’ve ever had and the handle is just out of this world. I really like the look of this scepter brushes. It has a rose gold color on the top handle followed by pink, purple then teal at the very end. I really like the craftsmanship, it looks like they’re carefully trim and cut with great precision. I felt it’s worth your money to invest in a good makeup brush. If you’re like me, then you might want this in your office too. What’s great about this is that you can use it as a fashionable paper weight and desk sign. Cool right!? P.S. The only down side I can think of is that it’s very fragile so a lot of tender, loving care is required but other than that, I think it’s really cute to look at and keep me motivated. A one stop shop that fills all your office needs. Of course I couldn’t leave Marshalls without picking up a home supplies, right? They’ve the cutest and most affordable home decors I’ve ever seen. What made me fall in love with this crate design photo frame was the message! Crazy huh! I’ve a hard time choosing which to take home with me but this one screams my name! I’m really happy with what I chose but I also have my eye on the “Wave your arms in the air like you just don’t care”! LOL! I’m super happy with what I picked up and if you haven’t been to Marshalls, I definitely urge you to visit the store and see it for yourself. So, what do you guys think of the items I picked from Marshalls? What are your thoughts? Share in the comments. Thanks so much for stopping by and read. I hope you find this post helpful. Don’t forget to stay tuned for Part 2 in the coming post! I love too faced! great deal! I never even thought of looking at beauty stuff at Marshall’s! I need those brushes. I recently bought the Two face shadows and I love how smooth and easy to apply they are! Thanks for sharing! Marshall’s just opened in my neighborhood and I am there everyday. I love their selection of beauty products! All of these are so awesome! Obviously, I need to get over to Marshalls soon! So cute! This is such a great deal! I also love Marshalls, it is so fun to shop there. I never know what I’ll find but always come out happy. Every time I go to Marshalls I know I will spend a lot of time looking at all the treasures you can find. Love it! What a great product to recommend. Loved the packaging especially the chocolate thing. So many great things! I love those brushes. My oldest has been asking me to get her some. I never even thought of Marshalls for beauty. Now I know I’ve been missing out! I picked up the Too Face Semi-Sweet Chocolate Bar Palette at Marshalls too! What a great score and I’m really enjoying the eye shadows. Those sounds like great picks. They’ve so many great stuff for such great price. I’m obsessed and love going back for more. LOL! I love shopping at marshalls, but I always forget about the make-up. Thank you for sharing and my next visit will be a first stop to the make-up area. Thanks for stopping by. Glad to hear this post helps! I love everything you got at Marshalls. We don’t have one nearby so when I travel, I always try to find one. I love their beauty products and always find neat things. I love all of the fun stuff that you can find at Marshall’s! That frame is so cute! Nice haul! 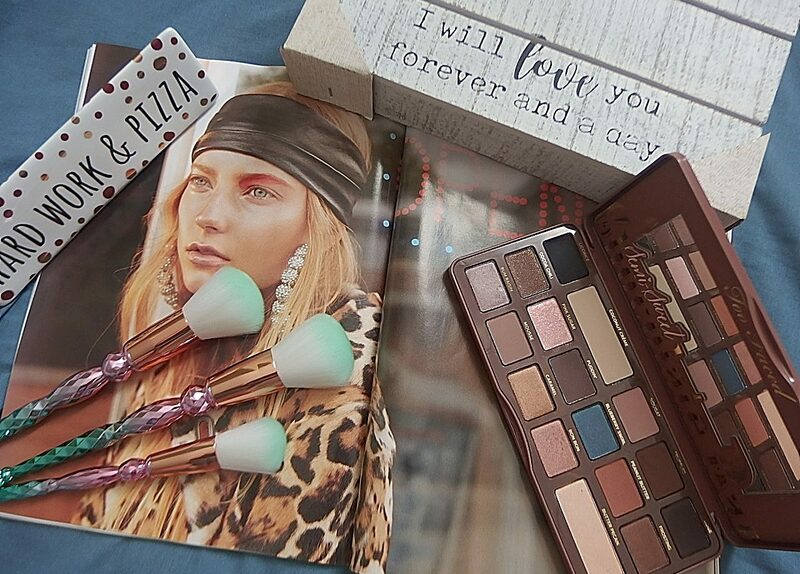 I would look forward to getting up and putting makeup with those awesome brushes you got. Those brushes are not only cute but they look super soft! I love it! Great finds!